Is Japan really the most powerful passport? Fake news downgrades a legitimate passport powerhouse – Singapore still holds the reigns. Kosovo was shamed into stripping Singapore from a visa waiver and has since went to Twitter to refute all the claims. We live in a fast-paced world where the hunger for content is bigger than ever. As all responsible journalists know, fact checking is at the heart of every good story, and despite the wave of congratulatory news saluting Japan’s rise to the top of the world’s passports, it is unfortunately not the case. Although Japan has been inaccurately subjected to international praise following this incident, it still deserves credit for many other accomplishments. Japan has been at the forefront of innovation in design, as well as one of the world’s major leaders in technology. Increasing tourism to the nation has also shed light on their rich cultural heritage and inspiring landscapes. However, in The Passport Index, Singapore remains the most powerful passport, as it can access 164 countries visa-free, whereas Japan has access to 162, ranking it in 3rd place tied with Germany. All our data is based on proprietary research from publicly available sources and official information provided by government agencies. Our strict methodology does not vary from day to day and does not artificially inflate rankings by including extraneous destinations. 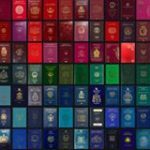 Empowered by Arton Capital, The Passport Index is the first and only real-time global ranking of the world’s passports, updated as frequently as new visa waivers and changes are implemented. Empowered by The Passport Index. Download yours. Want To Visit China Visa-Free? Passe/Port strives to cover relevant news, trends and updates on the fascinating state of global mobility. Curated by the team at Passport Index and by passionate bloggers from around the world, Passe/Port aims to be the premier reference to Global Citizens. BECOME A GLOBAL CITIZEN®. EMPOWERED BY ARTON.